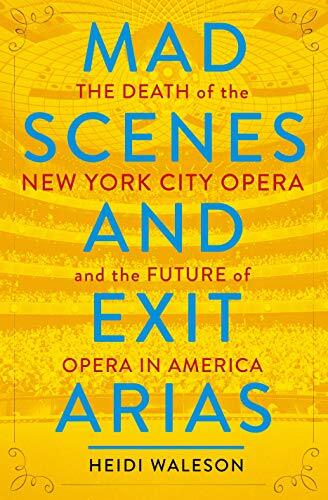 It is a rare arts journalist who can make reporting on the fiscal infrastructure of an opera company as interesting as the backstage dramas of directors, composers, conductors, musicians, designers and, of course, opera singers, but Wall Street Journal opera critic Heidi Waleson does just that in Mad Scenes and Exit Arias: The Death of the New York City Opera and the Future of Opera in America. The book opens on that fateful night in 2013 at the Brooklyn Academy of Music at City Opera’s US premiere of Mark-Anthony Turnage’s Anna Nicole about deceased model/actress Anna Nicole Smith. It was already a scandal when it premiered at the Royal Opera House in London, but backstage at BAM things were even more dramatic with the sudden announcement by the NYCO board that the show was going to close unless the company raised $7 million in two days. The company’s musicians immediately knew the real score; the board had just rung the death knell for the company itself. From that catastrophic opening night in 2012, Waleson chronicles the 70 years of NYCO’s stage triumphs and near deaths—artistic highs and financial lows. In the 50s, under the directorship of conductor Julius Rudel NYCO was in full bloom, stealing some thunder from the mighty Met, with its Eurocentric aesthetic, unlimited budgets, and international stars. But things got bumpier when the company moved to the State Theater, in the newly built Lincoln Center, literally in the direct shadow from the Metropolitan Opera, and sharing a less than acoustically ideal theater with the New York City Ballet. The move to Lincoln initially proved a success, but it also radically changed the company’s artistic brand as production costs and operating expenses of presenting opera in Lincoln Center soared. The ensemble makeup of the company, previously not reliant on big stars, proved more of a detriment as the company tried to compete for audiences who were used to the stellar lineup of marquee stars performing at the Met. But the company’s fortunes immediately became brighter with Beverly Sills’ breakthrough performance in Handel’s Giulio Cesare and performed in one hit after another and NYCO fans were clamoring for anything she appeared in. Over time though, Sills’ star power was not enough for a secure company future. Other issues, like musician strikes and not being able to pay the going rate for top singers, threatened sustainability and whole seasons had to be canceled. Other calamities like a warehouse fire that destroyed millions of dollars of costumes and sets, seemed insurmountable. Corporate funding was also shrinking and two key private donors, who kept the company solvent in its for years, died within the span of a year. Texas coal baron John Samuels was now New York based and named as NYCO chairman of their board. He locked horns with Julius Rudel, but named Rudel and Sills co-directors. Meanwhile, musicians were fed up with being slighted when their contracts were negotiated, and a series of strikes also threatened the company’s survival. Rudel exited and Sills took over the company, lobbying rich friends and charming wealthy patrons to bail out the company at crucial moments. Sills was also hands on artistically and business wise. She formed a NYCO touring company, she commissioned revivals of light operettas and operatic versions of musical theater hits like Bernstein’s Candide, Rogers and Hammerstein’s Carousel and Sondheim’s Sweeney Todd. She consolidated the separated spring and fall runs into one long season, which greatly reduced operating costs, she also made the decision to add super-title English translations onstage and setting off a trend for all opera companies. But even Sills successful rebranding eventually ran its course. She was bowing out and accepting a key position with the Metropolitan Opera. Conductor Christopher Keene took the company successful artistic directions, but took no interest in the fiscal health of the company and paid the price. His experimental and opera avant garde programming attracted new audiences, but not enough to make up for the disappearing old moneyed guard who wanted more standard repertory. Keene also was ill from HIV/AIDS though maintained a full performance schedule. Waleson writes sensitively about this time when the New York’s performing arts communities were especially hard hit by the epidemic in the ’80s and ’90s. When Keene died, Paul Kellogg, founder of the Glimmerglass Festival, took over. Kellogg addressed lingering issues with the orchestra, who by now, had a tarnished reputation of being under rehearsed. Kellogg allowed for more rehearsal time and made strategic changes with players, bringing in younger musicians, for instance. Kellogg’s other ideas were solid artistic ones, but the company’s brand remained in flux, when he decided he’d had enough a complete shutdown was planned so the acclaimed more avant garde director Stanley Mortier could reinvigorate the company. The 2008–09 season was put on hold, while the State Theater’s bad acoustics were being redesigned. The timing couldn’t have been worse as the stock market crash changed everything. Motier pulled out after the board only approved half of the budget he insisted on to relaunch the company. Meanwhile, the board was a complacent chorus that rubber stamped rash decisions, as new leadership took over, but kept the company on the financial ropes. It all came to the cliff hanging production of Anna Nicole and the backstage soap opera denouement of the highest order. Waleson’s reporting of the tumultuous history of NYCO is arts journalism at its best. And it should be a read as a cautionary manual of how to run, and not run, a performing arts organization. In the last chapter, Waleson writes of the company’s 2016 “resurrection” yet another time, rescued by opera lovers, and back to its smaller scale, but continuing with its earned reputation of the little company that could. Hopefully, it will succeed enough for Waleson to continue to give us the thrilling inside story.